Kimberly Gray, professor of civil and environmental engineering, has been named chair of the Department of Civil and Environmental Engineering at Northwestern University’s McCormick School of Engineering and Applied Science, effective August 1. Gray succeeds chair Jianmin Qu. Qu will leave the University on August 1 for Tufts University, where he will serve as dean of engineering. He joined Northwestern in 2009 as Walter P. Murphy Professor and department chair. Qu plans to work with Gray to ensure a smooth transition. With a courtesy appointment in the Department of Chemical and Biological Engineering, Gray is an expert in environmental catalysis and physicochemical processes in natural and engineered environmental systems. She specifically focuses on energy and urban sustainability applications. Along with collaborators from around the world, Gray explores the design of ecologically inspired, sustainable cities that can withstand the consequences of climate change. Gray has served as the co-director of Northwestern’s Global and Ecological Health Engineering Program since 2009 and formerly directed the Weinberg College of Arts and Sciences Environmental Science, Engineering, and Policy Program from 2003 to 2010. Committed to improving environmental policy, Gray is a member of Northwestern’s Institute for Policy Research and works closely with the Chicago Legal Clinic to provide the technical expertise needed to solve environmental problems for low-income, urban communities. She also previously served as a senior science fellow at the Environmental Law and Policy Center. Gray received her bachelor’s in biochemistry from Northwestern, master’s in civil engineering from the University of Miami, and PhD in geography and environmental engineering from Johns Hopkins University. Before returning to Northwestern in 1995, she served as an associate professor at the University of Notre Dame. Gray has authored more than 100 scientific papers and lectures widely on energy, climate, and environmental issues. She has also received numerous awards, including being named an Aldo Leopold Leadership Fellowship by Stanford University, Presidential Young Investigator by the National Science Foundation, Distinguished Scientist by Trinity University in San Antonio, Texas, and Sigma Xi Distinguished Lecturer. 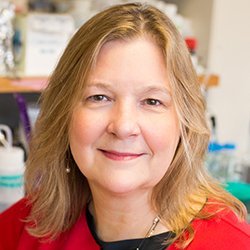 Gray has also received several teaching awards, including the McCormick Excellence Award in Research, Teaching, and Citizenship and being named member of the Northwestern Faculty Honor Roll two years in a row.